Well what fantastic customer service I received yesterday from a lovely lady called Margeret. I had had bought a pair of boots a few weeks ago and had them delivered, they were faulty so I called the store and spoke to a loveny lady who I later found out was Margeret then too. I explained the problem she told me to bring them in and I'd check them over and if they needed replacing she had my size in stock. I arrived at the store the day after to be greated by Margeret with a smile, I showed her the boots she exchanged them straightaway as she had reserved me a pair in my size from the phone conversation the day before. I hadn't asked her to do this for me so I thought it was so thoughtful. 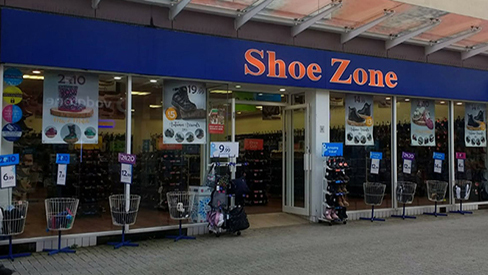 I would certainly carry on shopping at shoezone with such wonderful staff and fantastic customer service. I feel Margeret should be recognised for going that extra mile for her customers and making my trip into store a pleasant one. Thank you again Margeret your a lovely lady ?? Slippers bought on the 10/02/15, hardly worn & a hole has devoloped in the front of one of them. Tried to get them replaced & 2 members just no replacement - were't helpfull one little bit!!! !